FOD, or Foreign Object Debris, costs the aviation industry millions of dollars every year. This financial impact comes from direct costs such as damage to engines or airframes as well as indirect costs such as flight delays, cancellations, and lost revenues, schedule disruptions, and additional work by employees. More significant than the financial impact, however, is the safety impact and potential loss of human life. Even a small screw can destroy a turbine that costs hundreds of thousands of dollars. • Contaminants from winter conditions (snow, ice). From private airports and heliports to the busiest international airports, it is critical for the airport runways, ramps, aprons, and taxiways to remain clean and clear of any debris. Most airports conduct routine FOD checks where airport personnel will drive back and forth over the runways and taxiways looking for FOD that can potentially be material smaller than what can be seen by just glancing out over an open airfield. An administration should seriously consider implementing routine sweeping as a Best Management Practice (BMP) to reduce FOD at their airfields. Sweeping is the most effective equipment for removing FOD from airfields. Sweepers remove debris from cracks and pavement joints and should be used in all areas, including aircraft maneuvering areas. The areas in which ground support equipment (GSE) is staged should be swept as well. 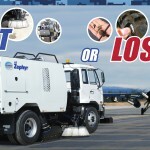 Schwarze Industries offers several sweeper models specifically tailored for today’s complex airport infrastructure. Whether the facility needs a dedicated high-speed runway sweeper, a general all-purpose airport sweeper, a parking area sweeper, or a garage sweeper, you can count on a Schwarze sweeper to get the job done.